Our “traditional” worship service is held in the main sanctuary; and runs about an hour. In this style of service you will find we worship through traditional hymns, wonderful organ music, choral arrangements, and bell choir specials. Our “blended” service is held in our main sanctuary and runs about an hour. This style of worship is less formal and features more contemporary praise music. Worship is led by our praise team of singers accompanied by piano, flute, drums, and guitar. Please feel free to wear whatever is comfortable for you. Some come to church in jeans and running shoes, while others wear a suit and tie, or business casual. There is no dress code for any of our services. Come a little bit early if you can. We will have the coffee pot on—feel free to take your cup into the service with you. We have handicapped parking and an elevator in the rear of the church. We have a parking lot in the rear of the church and a lot diagonal from the church near “Flowers by Deweys” as well. Handicapped parking spaces and an elevator is accessible from the rear of the church. How will my children worship? If you have children, our greeters will assist you in finding the appropriate classroom or nursery for them. Or, if you prefer, your children may stay with you in the service. ​We offer two age-appropriate classes during the latter portion of both traditional and blended services. These classes are offered during both worship services. Typically children attend the beginning of the service in the main sanctuary. After a brief children’s sermon where the kids are invited up to the chancel with the speaker, the children are dismissed to their respective classrooms. Sunday school classes are held from 9:40–10:40 a.m. each Sunday morning between the two services. For babies and toddlers, we offer a fully staffed nursery from 8:00 a.m. until noon. This covers both worship services and the Sunday School hour in between. 1st and 3rd Sunday evening from 5:30 – 7:00 pm for ages 8 years to 18. Little Disciples ages 4 to 7 years meeting 2nd Sunday from 5:30 – 7:00 pm. These classes promote spiritual enrichment that is Biblical, encourages all to draw nearer to the Lord so that we may better serve Him in our daily lives. First Christian Church of Martinsville is part of the Christian Church (Disciples of Christ), a denomination of more than 3500 congregations across the United States and Canada. CHRIST We believe that God has been made known in Jesus Christ. To be a Christian is to follow Jesus in all that we say and do. UNITY We practice unity and inclusion at the Lord’s Table for the sake of mission and for the sake of the world as the one family of God. Most Disciples congregations do this by celebrating communion every Sunday. This is why we use the chalice as our logo. SCRIPTURE We are called to study and read scripture for ourselves. Rather than having tests of faith and creedal statements, we critically and thoughtfully study scripture, taking into account the historical and cultural context in which it was written. MISSION We move to answer God’s call for justice particularly in the area of care for the earth, the challenges for women and children, poverty and hunger and immigration. We seek to do this work in cooperation with other people of faith. Some say we “get dirty for Jesus” as a way of conveying the hands-on mission orientation of many of our faith communities. 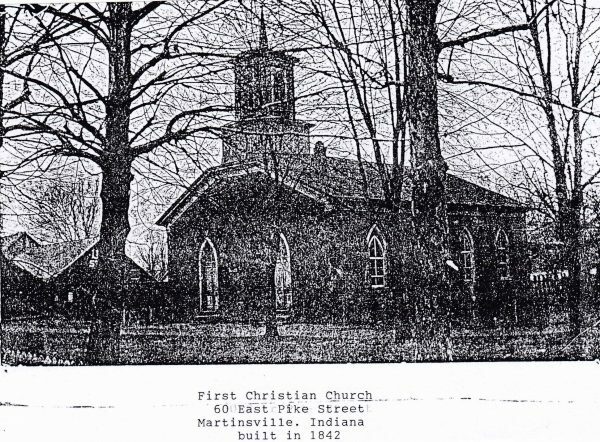 The First Christian Church of Martinsville was organized in June of 1835 and accepted no creed or discipline other than the authority of Scripture. A revival gathering in 1842 spurred the construction of the old brick church building on East Pike Street. Through the remainder of the 1800’s, the congregation experienced some shifts in membership, but eventually grew to a unity of over 400 individuals. 1891 work began on a new structure—our present sanctuary—which was dedicated in 1892. A Jubilee year was celebrated in 1899 when the full cost of the building and furniture, amounting to $16,080, was paid in full. Our church continued to grow rapidly in number, and in 1928 a new education building was completed and dedicated. Even against the odds of the Great Depression, the church was able to pay for the $50,000 cost of construction. After replacing the sanctuary roof in 1991, a $125,000 interior renovation was undertaken in the early months of 1992 which included a major rebuild of the chancel and the removal of all the paint that covered the beautiful wood grain throughout the sanctuary. The restored sanctuary was re-dedicated in April of that year. 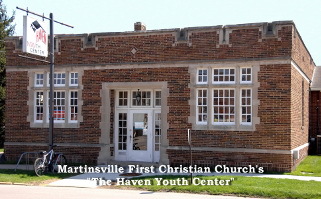 In 1998 the Haven Youth Center was founded. Since then, Haven has welcomed approximately 1500 middle and high school youth through its doors, each learning positive values that, no doubt, will have a life-long impact. 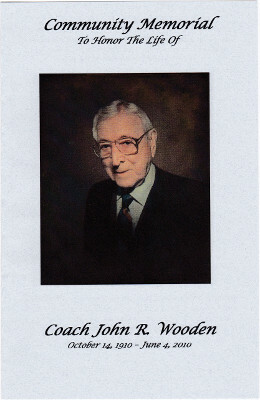 On June 27, 2010, the First Christian Church of Martinsville held a community memorial service for the passing of the famous basketball coach John Robert Wooden. John Wooden is the most well-known person from Martinsville. In his younger years he was a member of the First Christian Church of Martinsville (FCCM). After leaving Martinsville, he would return at times to visit and would attend church at the FCCM, doing this even in his later years traveling from his home in Los Angeles.